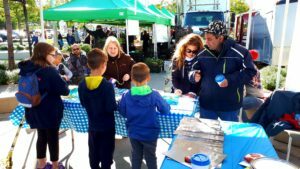 This past Saturday (Sept. 29) Community Living Central York had the opportunity to set up a booth at the Newmarket Farmers’ Market, located downtown Newmarket at Riverwalk Commons. It was quite an exciting day! 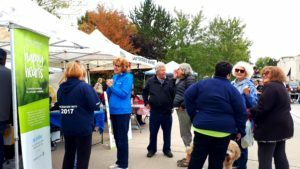 The market was exceptionally busy, as the last one in September, along with it being the Farewell Mayor in the Square for Newmarket’s Mayor – Tony Van Bynen. We were ready to get out, tell our stories and provide more information to our community about our organization and Capital Campaign. We met many new faces, along with some friendly ones who have shown us great support in the past – including Mayor Tony Van Bynen and Deputy Mayor John Taylor. Our booth was a hit! 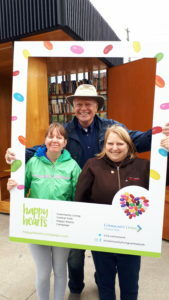 Filled with crafts, colouring and selfies, led by some of the people we support – Emily, Andrea, David, Patsy and Emerald. They recruited families and friends to come to our booth to be a part of the fun, while starting conversations about what we do. 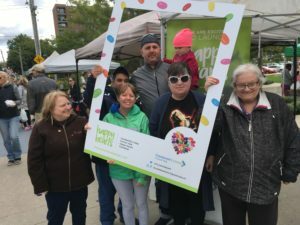 They were joined by current and previous Community Living Central York Board Members, our Executive Director, Colleen, Director of Services and Community Partnerships, Andrew and his family, along with other staff. 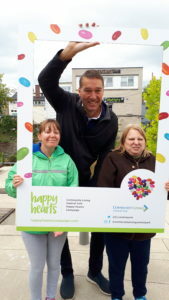 Thank you to the Farmers’ Market and its organizers, to all those that came and said hi, took selfies, provided donations and listened to our stories. We love being a part of this community, and together we are working towards the same goal – building a community where everyone belongs.